So Trump is Uber and conversely, Uber is Trump. This comparison has been made by both supporters and opponents, so as they say, there must be some truth in it. Both Uber and Trump have based their strategies on disrupting the status quo and the establishment with politically incorrect behavior. My argument here is simply that while the disruption fostered by both Trump and Uber may appear attractive at first glance, and desirable to many, in both cases, there are much deeper ethical issues that are only now coming to the forefront. Uber’s origins date back to a cold winter night in Paris in 2008, when founders Travis Kalanick and Garrett Camp were stranded without a cab. Having personally also been stranded in Paris without a taxi on a cold and rainy night, I can commiserate. But the real strategy behind the founding of Uber was to disrupt what they perceived to be an overregulated industry ripe for the picking, managed by municipalities and regional agencies ill-equipped to handle the kind of corporate pressure brought to bear by Uber. The Uber strategy involves massive PR, faux negotiations with slow-moving regulatory bureaucracies, followed by defiantly ignoring the law, which Uber euphemistically describes as “principled confrontation.” It is nothing less than blitzkrieg. Similarly, Donald Trump has crafted his strategy to disrupt politics as usual, with political incorrectness, bluster, and bombast. Both Travis Kalanick of Uber and Donald Trump share the same odd appeal for their disruption, but both also have armies of critics who perceive much deeper and disturbing issues. 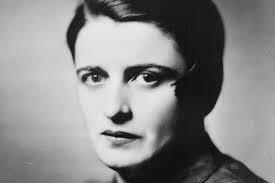 It all has an air faintly of Fredrick Nietzche’s Man and Superman and Ayn Rand’s philosophy of total self-interest. I also ask rhetorically why and how Uber has managed to attract such a massive unprecedented pile of investment capital. Uber is the current global symbol of defiant confrontation with any and all regulation of industries. Some are arguing convincingly that the huge pile of cash may have to do with sheer plutocratic greed, driven by Wall Street lobbyists, keen to roll back all regulation of capitalism everywhere. There is no shortage of circumstantial evidence that this may be correct, from the ongoing global banking scandals to corporate tax evasion. Both Trump and Uber also now appear to be hitting serious bumps in their strategies. 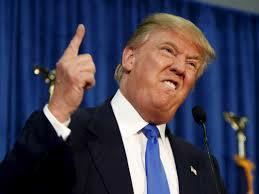 Trump ignominiously lost the Iowa Caucus and is facing a serious threat from a Republican establishment determined to stop his candidacy one way or another. Uber is facing its own disruption, a federal lawsuit by the California Public Utilities Commission, challenging Uber’s definition of their drivers as “contractors.” The California PUC lawsuit has spawned numerous other similar actions against Uber and is being closely watched by legal experts around the World, particularly in the European Union countries and India. 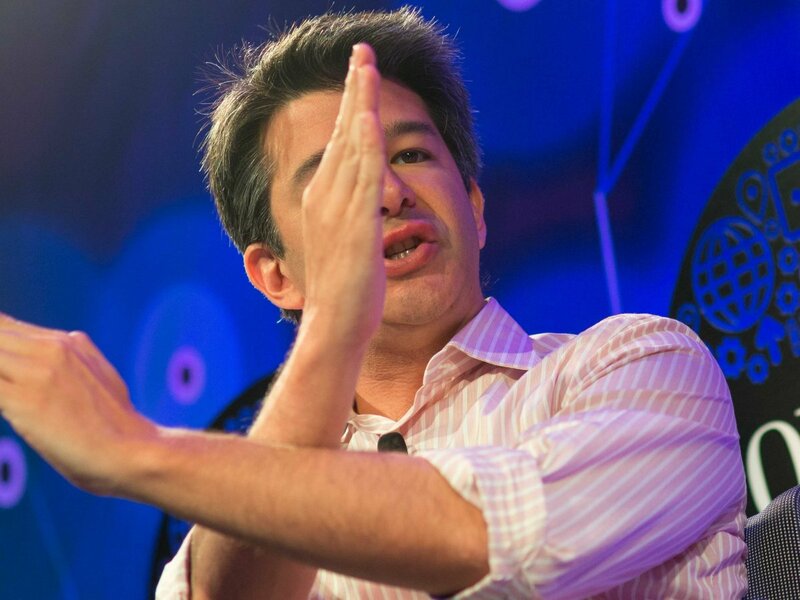 A decision against Uber could have major global consequences for Uber’s business model. 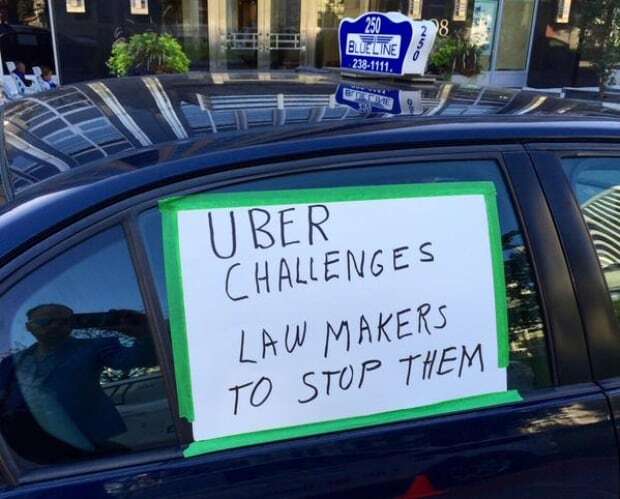 Meanwhile, organized protests against Uber’s practices, policies, and contractor pay have also evolved and escalated. The early protests were particularly unsuccessful and counter-productive, and which served only to aggravate the public. However, more recent protest strategies have been much more effective. For whatever reason, Uber elected to announce its intent to reduce contract driver pay recently, which has provided a strategic opportunity for organized protests in many cities. The core issue for me is the glaring distortion of Jeremy Rifkin’s Third Industrial Revolution into an unabashed corporate takeover of the sharing economy. The capital feeding frenzy around Uber is disturbing, and still a potential bubble if things don’t go as planned. It also betrays myopia for Big Ideas in favor of the quick buck. This is part three of a three-part series on Uber. Read parts one and two. Outraged taxi drivers the world over telling anyone who will listen that Uber is the devil in corporate form makes it tough, even for those so inclined, to blithely accept at face value the company’s argument that it’s just a technology firm disrupting a sheltered industry. It would be nice if that were the case. Easier. But nothing is ever that easy, is it? And neither is Uber. In fairness, you could say there’s much to like about a company that can deliver a prompt ride at the push of a button, often at a cheaper price than cabs. So far, so good. But that’s only the beginning of the Uber discussion. A closer look at the company’s particular brand of disobedience could quickly become unsettling. Uber may like to cast itself as a harmless scofflaw that’s willing to bend a few rules for the greater good, but legal experts say its practices are hardly benign. Working for its own narrow self-interest, the company’s systemic disregard for regulations — a stratagem termed “corporate nullification” — can undermine the laws of the land that everyone else follows. “This isn’t just an Uber problem. If they get away with it, every company will do this; every company will become a platform and just say ‘oh, the laws don’t apply to us.’ If we enter into that stage, then it’s game over for vast swathes of business regulation: environmental, insurance, civil rights, worker protection, consumer protection, that’s all gone,” said Frank Pasquale, a law professor at the University of Maryland. In the here and now, of course, warnings about the consequences of corporations flouting the rule of law can feel abstract compared to the immediate gratification of getting a cheaper ride to the airport. That may soon change. While researchers haven’t yet reached a consensus on the number of workers participating in the so-called gig economy, most agree that new forms of contract employment made possible by companies like Airbnb, TaskRabbit and Uber are on the rise. In the U.S., a recent poll suggests more than one in five Americans have participated in this type of on-demand contract employment. Part of the conversation now taking place there, which is beginning to migrate to Canada, involves asking what responsibilities 21st-century companies will have to workers, as well as the rest of society. As it stands, employers and employees both pay to fund programs such as health care, employment insurance, Old Age Security and other parts of the social safety net. The question of who will cover those costs if the nature of work changes to include fewer traditional full-time positions — not to mention the fate of worker protections such as overtime and minimum wage — is still in search of an answer. Indeed, the recent popularization of the term “gig economy” reflects thisevolution of the work world to include more part-time and contract employment and fewer of the full-time jobs that have traditionally been the bedrock of the middle class. As for the more well-known term, “sharing economy,” it’s losing ground amidst a growing recognition that sharing isn’t really part of the equation. A transaction in which a passenger pays a driver wouldn’t seem to be any different from what happens with a taxi. Yet taking a cab isn’t known as sharing a ride. Wrapping itself in the language of the sharing economy, however, allows Uber to align itself with values like co-operation, sustainability and community. It’s a smart play, if disingenuous, particularly insofar as it helps to bathe a business model that’s so nakedly commercial in a kinder, gentler light. Uber, as is often pointed out, is libertarian to its core, whether it’s the company’s attempts to dismantle regulation or its belief in the righteousness of the unfettered free market. None of this, of course, makes Uber an evil corporation. At the same time, the speed at which the company, among the fastest-growing startups in the history of Silicon Valley, is crashing through the world puts it at the centre of any number of questions. On the front lines of those looking for answers is the taxi industry. The existing system may be flawed, overregulated, and too costly, but that doesn’t mean cabbies should just be written off as collateral damage — the result of rule changes inspired by the financial ambitions of a single company. By pushing cities into making immediate changes, though, Uber is manufacturing a binary choice. To limit the decision to Uber or the current flawed system, however, is a false construct. The taxi system doesn’t need to be overhauled tomorrow and changes could come in many different ways that allow for ride-hailing services while also protecting existing taxi drivers. The back-and-forth between Uber and the taxi industry opens up any number of considerations, ranging from practical to theoretical to troubling. If Uber’s continued success pushes existing taxi fleets out of business, it’s worth wondering what happens to fares. The company’s introduction of surge pricing, which allows the price of rides to float when demand outstrips supply, points in a direction that may have customers yearning for the regulated days of yore. A market monopoly may never come to pass, but Uber’s success to date, combined with the controversies that surge pricing have already inspired, doesn’t make it a comforting thought. 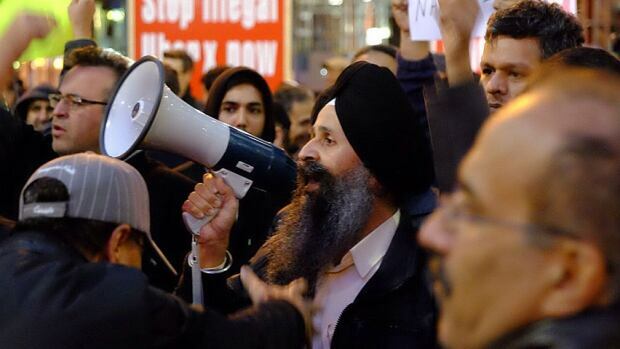 The us-versus-them dynamic that’s developed between Uber and cab companies is also too often accompanied by an ugly undercurrent of racism that targets the ethnic makeup of the taxi industry. To be clear, this isn’t Uber’s fault per se, but it is an element of the ongoing confrontation that needs to be better recognized, understood and defused. 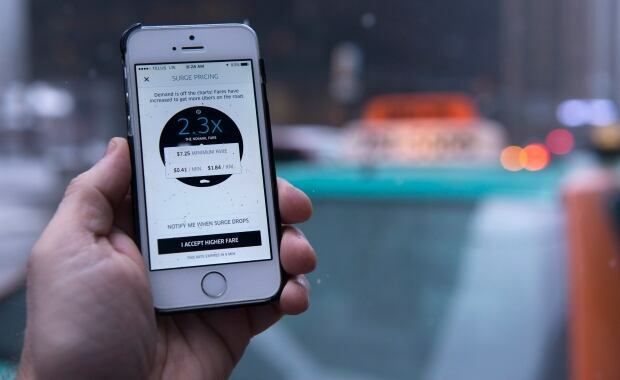 The many issues surrounding Uber can also become an issue in itself. 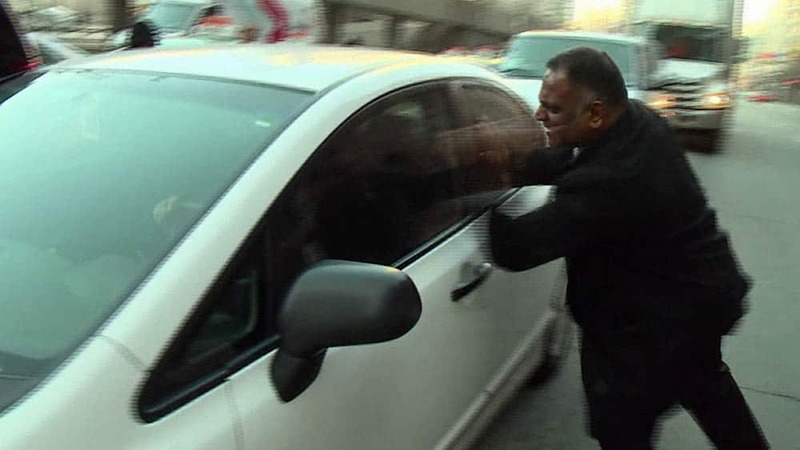 As tales of Uber’s unsavoury tactics continue to circulate, how does someone who just wants to take an Uber across town reconcile the tension between wanting to be a good citizen, yet also a savvy consumer at the same time. One theory, put forward by Robert Reich, suggests that no one can be blamed for seeking out a cheaper ride, regardless of how conflicted they may feel about the company offering the service. Our consumer selves, he says, are wired to look for the best deal possible and, on some level, we’ve made peace with what that entails. At the same time, he continues, serious thought must also be given to the responsibilities of citizenship. As Uber inspires changes to the existing system, the idea of what our citizen selves might contribute to the discussion is worth considering. Yes, change is going to happen and outdated regulations need to be updated. How those changes happen, though, also matters a great deal. And not just to cabbies.